Broadly speaking, there are three levels of functioning in any child. The first level is the independent level. Any task given to the child, (whether it is reading, writing, math, comprehension, art or craft) if he is able to do with 99% accuracy, then he is at independent level for that activity. This means that he does not require any teaching or supervision to complete this task. He will be able to complete the task on his own and can even check his work. Ideally homework given should be at the independent level. The concluding activity of any (one hour) remedial session should be at the independent level, as it will motivate the child to come back for the next session. He will leave with a sense of accomplishment and nothing will motivate the child more than a success experience! Tasks at the independent level can also be assigned when the child has come to class after a particularly taxing day. It helps him relax and feel good about himself. This will motivate and prepare him for the tougher tasks that may follow. There will be instances when the teacher herself may experience fatigue. It is best to avoid introducing any new/challenging concept to the child since the teacher may not be at her best frame of mind. Assigning any task that the child can do independently will be easier on both. It is important to understand that any task does not automatically come under independent level just because it is below the child’s current grade level at school. The teacher should understand & assess the child thoroughly and arrive at his independent level of functioning. For some students reading may at independent level just one grade below (i.e. a class V student may read at grade IV independently) but spelling may be at independent level two grades below. So it is important to have a complete profile of the student in each academic area of reading, spelling, math, comprehension etc. and determine his level of functioning. Any good lesson plan should include a combination of activities at varying levels of functioning- independent, instructional & frustration, but conclude with a task at the independent level. The art of remedial teaching lies in drafting an effective lesson plan and an IEP for the student. Remedial teaching must be completely child centric. So it automatically follows that there is no prescribed syllabus or text book that will be suitable to all children at all times. The remedial teacher should understand the profile of the child. Profile would mean strengths & weaknesses. The teacher should use the child’s strengths to address his weaknesses. The Individualized Educational Plan(IEP) and the lesson plan should be customized to suit that particular child. Of course, there are common mandatory activities like flash card drill, phonetics, spelling rule, reading intervention etc. which are applicable to all. But at what level we will begin, what modality will be used, what supplementary intervention is required (ex: OT, speech therapy etc.) should be child specific. Remedial is not merely a cluster of five/six academic activities. Ex: if a child has done some reading, writing, spelling, math & comprehension activities along with some random worksheets, it does not mean that the class is complete. This will not be beneficial if adequate thinking has not gone behind it. Planning & goal setting are very important. The teacher should always be alert & have a reason behind every activity/worksheet/game given. Why am I asking the child to do this? How do I choose a particular reader/ comprehension passage/math activity etc.? Each and every session is important for the teacher because there is scope to observe the child & gain some insight about his learning behavior. Every session should be used by the teacher to understand the child better and to hone her own skills. With every such experience, her ability to reach the child will get better. If one cannot reach the child, she cannot teach the child. Remedial plan should be purposeful, specific, cumulative and customized. It should simultaneously be challenging and fun. If it is too easy, the child will not be motivated & if it is too tough, he will get frustrated. Intervention should be done with total sensitivity to the child’s level of functioning. It should have variety, should be multi-sensory and there should be enough scope for flexibility. Teachers will be able to reach the child only if they show some amount of sensitivity and thought in creating an appropriate lesson plan. IF not improvement of the child will soon plateau and attending remedial class will become a monotonous, routine drudgery! Having said so much about 7-year-old Raman and his challenges in reading, I feel it is important to share this episode that happened during remedial class this week. It reiterates my view that learning is not at all about reading & writing. 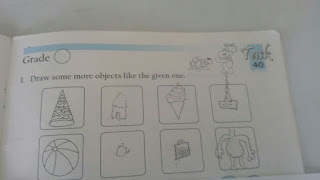 Raman was given this worksheet that you see below. The instruction had to be read out to him by his teacher and explained to him in Tamil. Then Raman proceeded to work on it independently. The first row was a cone, so he drew a hut having a conical roof, a cone ice cream & a birthday cake with a cone shaped icing (though to us it looks like a paper boat). Once he came to the second row, he gave it a lot of thought. The first figure was very easy for him. Then after a while he drew the second & the third. 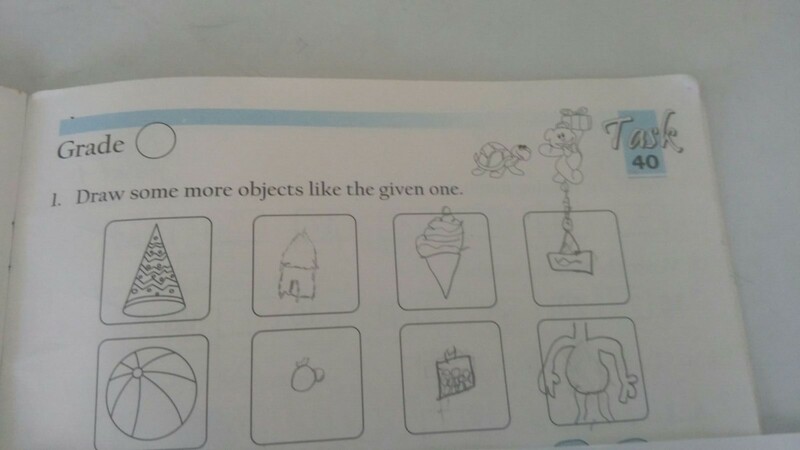 He asked his teacher to take a guess. She said that the first one looked like a ring! He said,” No ma’am. It is a bid laddu with one kismis (dry grape) & one cashew nut!! The second one was quite tricky! Teacher guessed that it was a bottle filled with pebbles! His answer was that it was a glass hundi (piggy bank) with round coins! The last one of course was easy. He said that it was a police man’s paunch! Originality, spontaneity, imagination & creativity of a child with so much potential! This is an outstanding example of right brained thinking that children are so good at. Looking at things from different perspectives & making unusual & quite often hilarious connections is second nature to them. It is my sincere hope that over emphasis on academics does not destroy their natural curiosity and spontaneity. Yesterday after a long time, I sat to do remediation for one of our younger students, Raman aged 7 years. Raman is a charming, smart young boy diagnosed with LD- dyslexia along with severe ADHD. He joined our remedial pullout program. He was reading sentences at the first grade level. After reading the word list at the top of the page, Raman started yawning. Eyes began to water. He became restless and fidgety within the first few minutes. He began answering every question posed by the other teachers to their respective children. He kept turning this way and that way, his attention on every other thing except the printed word. He was so distracted that even letter identification became a problem. By the time we finished, he was totally exhausted in spite of the two toilet breaks taken in between. This entire episode lasted for all of 10 minutes. Over the years this behavior has fascinated me. A child with so much prior knowledge & an active mind struggling to decode the printed word. The frustration & fatigue the child faces can be very demotivating. This can easily develop in to a reading block and lead to severe learning resistance later or during the school years. My challenge as a remedial teacher has been to see that the child remains motivated & develops a positive attitude towards reading. He has to develop self-confidence and believe in himself that he can. My definition of teaching would be: facilitating learning & helping the child achieve his potential. Keeping this in mind, my approach would have to be -Here is a child with immense potential, unlimited curiosity, eagerness and enthusiasm to know & understand the world. How do I teach him so that he will make/ enjoy learning a life long journey? Teaching should always be about the child and not about either the teacher or the syllabus. It happened on a Thursday evening, nearly ten years Ago. Varun’s remedial class had just got over. We were working on page 3 of the instrument Comparisons. His mother requested to have a word with me. Varun was around 12 years at that time, studying in class VII in a main stream school. He had been attending one to one remedial classes with me for nearly two years then. We had addressed his issues of reading, spelling, math & comprehension and the improvement was very gradual. His exam performances were inconsistent, sometimes he could score up to 80% and sometimes he would score single digit marks. Varun’s school refused to understand his issues of attention & learning though both his parents were extremely cooperative and willing to do anything within their means. I gave Varun a jigsaw puzzle to keep him busy and called his mother. After prolonged hesitation & discomfort, varun’s mother finally came to the point. She expressed her view that I should not be spending so much class time on teaching thinking skills, but focus more on academic areas, especially since his marks were inconsistent. The school was complaining a lot and threatening to detain him. I listened patiently and tried to explain the philosophy behind the IE program. Teaching thinking skills was an integral part of the remedial program and the results can be perceived only after a long period of time. I tried to convince the parent that we needed to bring about a qualitative change in the child and equip him with adequate cognitive skills to make him an independent learner& a holistic individual. (of course), out of great respect for me and the fact that varun was attached to me, his mother reluctantly gave in. Varun & I worked on several instruments of the IE program for almost two years along with study skills and other academic areas. Out of three classes per week, one class was allotted to IE program. Today Varun is a marketing professional in the financial services industry. He appeared a s a private candidate in 10th & 12th and scored above 80%. He obtained an MBA from a reputed college and secured a job immediately. He has very good communication skills, is very organized and mature for his age. He is well aware of his strengths & weaknesses and never hesitates to acknowledge his need to seek guidance / support. He is able to prioritize his goals and has good decision making skills. Remedial intervention is rather incomplete if thinking and reasoning skills are not included in the program. The IE program teaches the child critical thinking skills through paper pencil activities. The methodology is called ‘Mediated Learning Experience’ or ‘bridging’ of specific thinking skills at three levels of input, processing & output. Skills like planning, systematic thinking, problem definition, hypothesizing, empathizing, information gathering, problem solving, comparing/categorizing etc. are taught. Dyslexics have significant difficulties in information processing skills and restraining impulsivity. So teaching them specific thinking skills and how & when to apply them should be made an integral part of the remedial program. Mathematical intelligence is only one among the many types of intelligences put forward by Edward Gardener in his theory of multiple intelligence. But in our society, there is a myth that if a child is intelligent, he has to score well in math. Generally, we find many school going children having difficulties with mathematics and which is why maths tuition teachers are in great demand. So, more importance and focus is given to math teachers. Difficulty with math is labelled as dyscalculia. It can occur along with dyslexia or in isolation. But the challenges in learning math are not due to differently wired brains as in the case of dyslexia. Quite often the difficulty in acquiring math skills may be precipitated or aggravated by four major factors. · Inadequate time spent in establishing the basic mathematical reasoning at the pre-primary level. · Unrealistic pace of the math syllabus which does not give the child enough time to internalize, establish, apply and generalize the concepts learnt. · Disregard for readiness –It is important to keep in mind the cognitive maturity of the child to understand the mathematical concept. · Bad teaching- The teacher focuses more on the product than on the process which means the marks scored is given more importance than the child’s ability to do mathematical reasoning. Dyscalculia does not merely mean lack of comprehension of word problems. It is much deeper than that. A child with dyscalculia struggles with very basic things like number concept, one to one counting, place value, more/less, before, after, between etc. If these issues are not addressed, it leads to secondary mathematical issues like difficulty with mathematical operations, word problems, and higher order reasoning. Broadly speaking, math teachers should focus on developing and mastering pre number skills, math vocabulary (big, small, more, less, ascending, descending, predecessor, successor, factors, multiples), inter relationship of mathematical concepts (connection between addition and multiplication, addition and subtraction, fractions-decimals –percentages etc) reversibility of mathematical operations, writing a mathematical sentence before moving on to abstract math concepts etc. In conclusion, there is art in teaching maths. The joy of learning should not be lost in the dysfunctional practices of comparing, competing and criticizing. Math, it should be remembered is a life skill. Therefore, it is our responsibility to keep the children motivated to learn math.